Could you offer a ‘forever home’ to one of our cats or kittens? Below is a list of all the cats currently available for adoption. All of our cats are neutered, vaccinated and chipped prior to homing, and all use their litter trays. 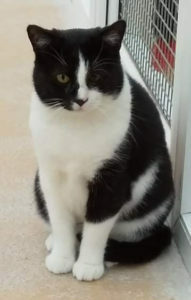 If you are interested in adopting a cat, please start by reading the information on our 6-step adoption process: https://www.coventrycatgroup.org.uk/adoption/the-adoption-process . Feel free to contact us if you would like to discuss any cat in more detail. We are also looking for safe homes for working cats and kittens– please scroll to the bottom of this page for further information or click on the ‘Feral’ tab above. These are cats rescued from unsafe environments who have been neutered, vaccinated and chipped, and are now looking for a safer place to live outdoors but with shelter and regular food. Thank you for your support! 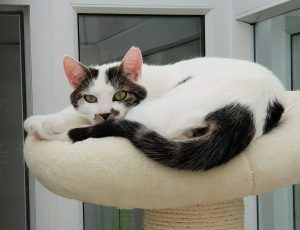 Abby(CCG 1741) Lovely Abby came into CCG care as her owner could no longer take care of her and has been waiting a long time for her forever home. 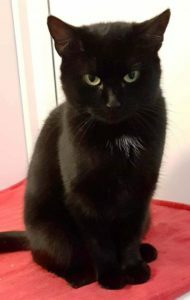 Abby is a sweetheart who likes fusses and to sit on your lap, she would benefit from having access to the outdoors as she does like to go out sometimes. 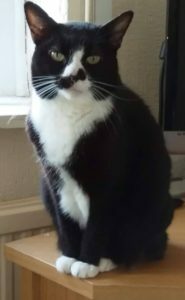 Abby has been used to a quiet home where she has been the only pet so would be better with no children or other pets in the house. Please click on the Adoption Enquiry Form to enquire about Abby. 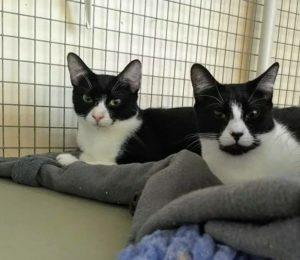 Sam (tabby patches) & Dean (blk patches)(CCG 1826, 1825)These sweet boys were trapped by us at a colony site, they have come on so well and are now looking for their forever home. They are still a little nervy but love to play and are happy to interact with people, they also love their food! We are looking for an indoor home for these sweet boys. Wocket & Brock (CCG 1818, 1819) These sweet girls didn’t have the best start, they were born in a garden as part of the second wave of a large colony that we had been helping. Fortunately those days are far behind them and they are now ready to enjoy lots of home comforts. Wocket is the more confident of the two and enjoys a fuss once she gets to know you, Brock is a little more nervous but we have no doubt she will soon come around. We are looking for a quieter indoor home for these two lovelies. Lola & Kena (CCG 1742-43) Lola & Kena were originally at CCG as kittens and have come back to us through no fault of their own. Kena likes to sit on your lap and Lola likes a fuss when they get to know you, they are both very sweet. Lola is the most confident of the two and likes to play, Kena is quieter but likes to play fight with her sister. We are looking for a quieter home for these two with no children, they could live with other cats. 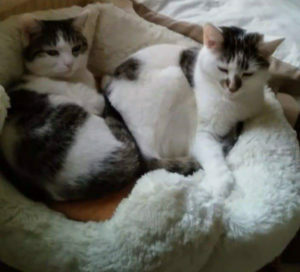 Lola & Kena are approximately two years old and are to be homed together. 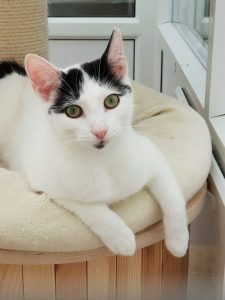 Gaia (CCG 1846) If you follow us you may remember pretty Gaia as our super mummy who not only had five kittens of her own but also took on three foster babies. Her work is now done as a mum and this beautiful girl now deserves her own home. Gaia is friendly but a little shy but she likes fusses once she gets to know you. We are looking for Gaia to be the only pet in a quieter household. Benji (CCG 1900) Benji was a stray who had been living in a garden. He is a shy boy, but loves fusses once he gets to know you. As you might be able to see from the picture Benji has one eye that has suffered an injury in the past, this doesn’t affect him in anyway and does not require any ongoing treatment. This little sweetheart deserves a forever home where he can be adored, Benji will need a quiet indoor home with no children or other pets where he can truly shine. PLEASE neuter your cats so that you don’t add to the current kitten overpopulation problem! We receive enquiries every week to take in unwanted / abandoned kittens and we just don’t have any more space – our centre pens and foster places are currently all full. All cats and kittens leaving our care are neutered / spayed, chipped, vaccinated, wormed and de-flea’d and come with an up-to-date Vet card and Adoption paperwork. Homes on or near busy roads. Homes where there is no safe garden for the cat to escape to. Kittens to homes with children under five years old. Kittens to homes where there is no-one at home all day.Rented properties unless we have a letter of confirmation from the landlord to say that cats are allowed at the property. We also prefer to home kittens in pairs …. We currently have no Mums or kittens available for adoption. 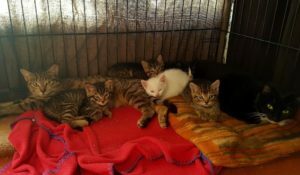 We are now offering kittens (and their mums) for reserve, you will still need to fill in adoption form and have a homecheck but if you are successful you will be able to visit & reserve a kitten/s for a non refundable deposit of £50 per kitten until they are ready to go to their new home. All cats and kittens leaving our care are neutered / spayed, chipped, vaccinated, wormed and de-flea’d and come with an up-to-date Vet card and Adoption paperwork. We currently have no Mums or kittens available for reserve. Feral / Working cats cats are rewarding. If you have stables, farm, small holding, safe factory or even a large garden they will take care of any rodent problem in return for somewhere dry and safe to sleep and regular feeding. Cats hunt best when they are fed and healthy. Feral cats are wonderful to watch interact with each other and eventually, if allowed, find out and enjoy home comforts. 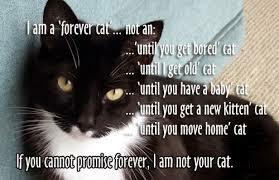 Once you have gained the trust of a feral cat, they are a friend for life. 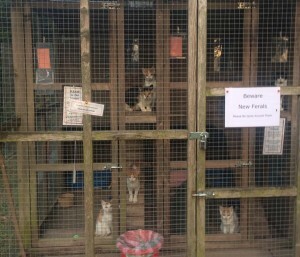 If you are able to offer a home to feral cats (eg. 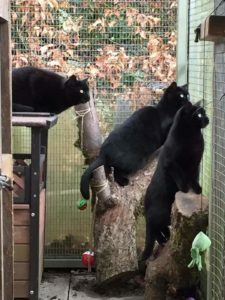 in a smallholding, farm or stables) please click here , as we currently have a number of feral and semi-feral cats in our care who need a home .